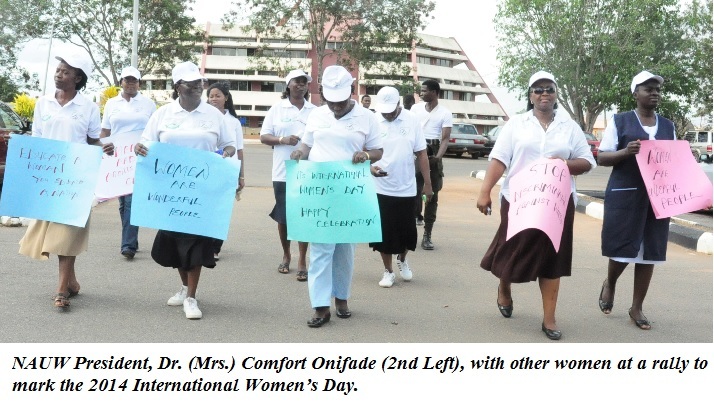 The National Association of University Women (NAUW), FUNAAB Branch recently celebrated this year’s International Women’s Day with the theme, Women Inspiring Change, amidst pomp and pageantry. The President of NAUW, Dr. (Mrs.) Comfort Onifade, disclosed that the United Nations (UN), had declared the annual celebration of the International Women’s Day as a day set aside not only to honour women, but to also recognise and appreciate their various contributions to the development of the society. Speaking at the occasion, Mrs. Iquo Ukoh, Director of Marketing, Nestle Foods Plc, noted that although a reasonable number of women were at the helm of affairs in their various organisations, the percentage was still very insignificant. She however stated that things were getting better today for women, in terms of opportunities just like their male counterparts, unlike before. In her lecture titled, Gender Balance in Corporate Environment: Where Are We?, Mrs Ukoh, the first woman to become a Marketing Manager and the only female on the board of Nestle Food Plc, said that women needed a lot of effort, preparedness, skill, emotional intelligence and professional maturity, to get to the top. According to her, women should be assisted to achieve their God-given potentials at their work place, while stressing the need to maintain a balance, in order for the woman’s home front not to suffer at the expense of her profession. She was quick to add that a woman cannot do it alone, but would require the full support of her husband, as she implored women to always carry their husbands along in whatever they do. The Vice-Chancellor, Professor Olusola Oyewole, appreciated the womenfolk for their impact in the society. Represented by the Dean, College of Agricultural Management and Rural Development (COLAMRUD), Professor Bola Akeredolu-Ale, the Vice-Chancellor stated that women have gone a long way in moving the University forward in many ways. He said the theme for this year’s celebration was very apt and could not have come at a better time, as he expressed his confidence that women could perform better in any chosen endeavour, if given the enabling environment. 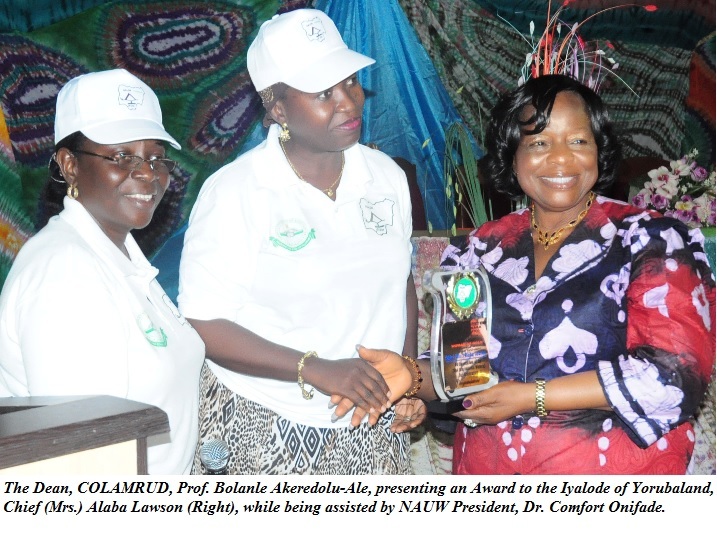 Highlights of the occasion included the conferment of NAUW awards on deserving women such as: Chief (Mrs.) Alaba Lawson, the Iyalode of Yorubaland; Professor (Mrs.) Mosunmola Obidike; a University don and Mrs. Agnes Okodua, a courageous and resilient woman. In addition, two indigent students of the University were awarded scholarships. They are: Miss Sanni Fatimah of the College of Veterinary Medicine (COLVET) and Miss Rasheed Fatimah of the College of Plant Science and Crop Production (COLPLANT), respectively. The scholarships would be for entrepreneurial training at the University Centre for Entrepreneurial Studies. Others events included an Awareness Rally, Launching of the FUNAAB NAUW Crèche and Secretariat, Medical check-ups, Performances by the FUNAAB Theatre troupe, as well as students of the Federal University of Agriculture, Abeokuta International School (FUNIS), whose presentation was titled, Empower A Woman, Empower A Nation.